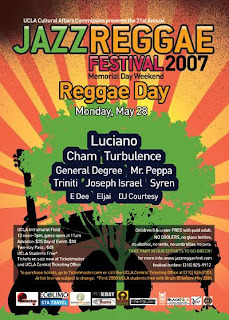 Caribbean Lifestyle Media-On Memorial Day the annual JazzReggae Festival kicks off at UCLA Intramural Field. The event is said to have drawn up to 30,000 attendants. This year event features Tanto Metro & Devonte, Cherine Anderson, Peetah & Mojo Morgan, and Assassin. This year marks the 24th year that the concert has been held. JazzReggae told us " We are very excited to announce that this year they have partnered with UCLA’s Music Partnership Program. This program sends UCLA Music students to underserved public schools in Los Angeles who have lost their music programs. These students teach and mentor at schools in order to instill music in the next generation of students who have been deprived of this educational and extracurricular opportunity. Between weekly group lessons and private instruction, this program inspires 1,500 inner city youths annually. JazzReggae Festival has pledged their help in the continuation of the Music Partnership Program."